Comment You will get hungry for sure! First of all i like this game alot, but there is a few things i dont like as much, its cd32 , its on an cd and i have the AGA disk version also, so what happens? ,they are identical except for the controller settings. 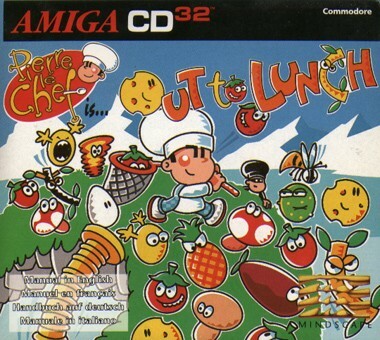 This game is varied, has alot of oldskool into it as its basically Mario bros meets Burgerman, the plot is more or less that your a cook and all your vegetables etc escaped and grew legs and intelegence :D, pretty weird,and your mission is to collect all and put em in a cage to complete the level and the whole game. The Gameplay , well its basic and easy to understand, its a plattform game (ala Bubble bobble) and you need to jump on the vegetables or use some sort of a weapon , ranging all from sugar bags to flamethrowers and when u have either grilled em or hurt them (in any way) Then you must use your net (a pickup) and grab em with it , the nets and the powerups are in general pretty easy to find for the first 5 levels,and after u have used the net then u should do this to all u can find and go to the CAGE and lock em up, later in the game enemies will open the cage from the outside and let all out if you dont pay attention, also some of the nice (vegetables) can get mean, they will grow and hurt you if u dont put em to sleep, also one of the niggles with it is,if you kill to many enemies then you wont complete the level as after a while they will turn into normal vegetables again. After you have done all this you will have to search for the exit (in the beginning its pretty easy,later on you will have to try a few times. The Game uses Passwords,but the gui is bad andits not perfect (hard to see if its a A or a H problem etc, bu it work fine) Every level is time based, if you run out of time then level starts all over again, but luckily there is pickups/bonuses that add more time to your clock. The music and sound + graphics . well they are decent really, but the music is great on later levels, its like thoose you will remeber pretty good even after a few years away from the game,and start HYMNING :D , sound FX are ok,but they are the same troughout the game,and well u might get abit fed up with em , and the gfx is well done with nice scrolling (50hz) and full screen Backdrops. The Controls , well they are great, but sadly very sensitive and with a orginal cd32 pad,well then you will have A lot of problems to complete some levels, as you would use too much time to try and reach a height and end up frustrated,so i would recomend a Honeybee joypad (competetion pro Cd32 pad) but that one is still abit loose so you would need alot of practice to be perfect. Additional Info , This game is a console game, it has the console gfx and the sound + it have the gameplay and the cd32 is a console so you should try a CONSOLE game on it then :D,its damned clean and nice to play,fast and super smooth but it have some controlling niggles and its too small really to be on a cd (game it self is big (many levels),and in the end of day this is a good game. Shamely there is NO intro ,NO CDDA and NO SAVE.